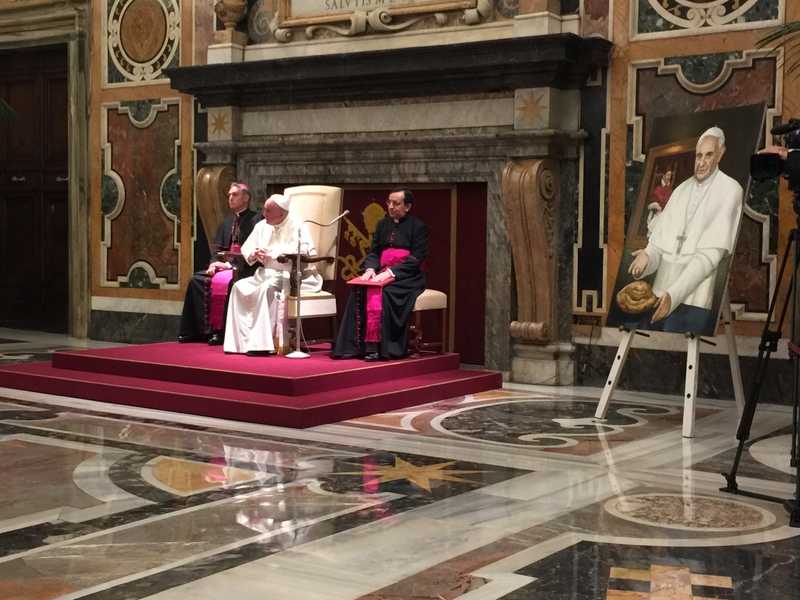 Pope Francis received in audience today the National Council of the Order of Journalists. After an address by the Prefect of the Secretariat for Communication, Monsignor Dario E. Vigano and of the President of the Order, Enzo Iacopino, the Pope delivered the following address to those present. I thank you for your visit. In particular, I thank the President for the words with which he introduced our meeting. I also thank the Prefect of the Secretariat for Communication for his words. There are few professions that have so much influence on society as journalism does. The journalist has a role of great importance and, at the same time, of great responsibility. In some way you write the “first draft of history,” constructing the agenda of the news and introducing persons to the interpretation of events. And this is so important. The times change and the way of working of the journalist also changes. Though the printed paper or television lose relevance in respect to the new media of the digital world – especially among young people – when journalists have professionalism, they remain an important pillar, a fundamental element for the vitality of a free and pluralist society. In face of the changes in the world of media, the Holy See has also lived and is living a process of renewal of the communicative system, of which you also should benefit; and the Secretariat for Communication will be the natural reference point for your valuable work. Today I would like to share with you a reflection on some aspects of the journalistic profession, and how it can serve for the betterment of the society in which we live. It is indispensable for all of us to pause to reflect on what we are doing and on how we are doing it. In the spiritual life, this often assumes the form of a day of retreat, of deeper interior reflection. I think that in the professional life there is also need of this, of a bit of time to pause and reflect. This is certainly not easy in the journalistic realm, a profession that lives with constant “delivery times” and “expiration dates.” But at least for a brief moment, we will try to reflect a bit on the reality of journalism. I will pause on three elements: to love the truth, something essential for all, but especially for journalists; to live with professionalism, something that goes well beyond laws and regulations; and to respect human dignity, which is much more difficult that one might think at first sight. To love the truth does not only mean to affirm it but to live it, to witness it with one’s work — to live and work, therefore, with coherence in regard to the words that one uses for a newspaper article or a television service. The question here is not to be or not be a believer. The question here is to be or not to be honest with oneself and with others. Relationship is the heart of every communication. This is all the more true for one who makes of communication his metier. And no relation can stand and last in time if it rests on dishonesty. I realize that in today’s journalism – an uninterrupted flow of facts and events reported 24 hours a day, and seven days a week – it is not always easy to arrive at the truth, or at least to come close to it. In life not all is white or black. In journalism also, it is necessary to be able to discern between the shades of grey of the events that one is called to report. The political debates, and even many conflicts, are rarely the outcome of clear, distinctive dynamics, where we recognize clearly and unequivocally who is wrong and who is right. The confrontations are sometimes clashes; at bottom, they are born in fact from the difficulties of synthesis among the different positions. This is the work, we can also say the mission – at the same time difficult and necessary – of the journalist: to come as close as possible to the truth of the facts and never say or write something that one knows, in conscience, is not true. Second element: to live with professionalism means first of all – beyond what we can find written in deontological codes – to understand, to interiorize the profound meaning of one’s work. From here stems the need not to subject one’s profession to the logics of partisan interests, whether economic or political. A task of journalism, I dare say its vocation is, therefore – through attention, care in seeking the truth – to have man’s social dimension grow, to foster the building of true citizenship. In this perspective of a wide horizon, therefore, to operate with professionalism means not only to respond to the concerns, though legitimate, of a category but to have at heart one of the architraves of the structure of a democratic society. It must always make us reflect that, in the course of history, dictatorships – of whatever orientation or “color” – have always sought not only to control the means of communication, but also to impose new rules on the journalistic profession. And third: to respect human dignity is important in every profession, and in a particular way in journalism, because behind the simple reporting of an event there are also sentiments, emotions, and, in short, the life of individuals. I have often spoken of gossip as “terrorism,” about how one can kill a person with the tongue. If this is true for individual persons, in the family or at work, it is all the more true for journalists, because their voice can reach all, and this is a very powerful weapon. Journalism must always respect a person’s dignity. An article is published today and, tomorrow, it will be replaced by another, but the life of a person unjustly defamed can be destroyed forever. Criticism is certainly legitimate, and I will say more, necessary, as is the denunciation of evil, but this must always be done respecting the other, his life, his affections. Journalism cannot become a “weapon of destruction” of persons and even of peoples. Nor must it fuel fear in face of the changes and phenomenons such as migrations forced by war and famine. I hope that increasingly and everywhere journalism is an instrument of construction, a factor of common good, an accelerator of processes of reconciliation, which is able to reject the temptation to foment clashes, with a language that blows on the fire of divisions, and, instead, that it foster the culture of encounter. You journalists can remind all every day that there is no conflict that cannot be resolved by women and men of good will. I thank you for this meeting. I wish you every good for your work. May the Lord bless you. I accompany you with my prayer and my sympathy, and I ask you, please, to pray for me. Thank you.